Here at Wiggle Room, we believe that life in the soil is the most important and most commonly ignored aspect of growing food. No matter what you're trying to grow, plants need certain nutrients and minerals. Microbiological life connects your plants to these nutrients and creates an environment where your plants can continue to access and use these nutrients throughout their growing cycles. Click on any microbe name to learn more! The first and most basic components of microbial life are bacteria and fungi. While plants represent the first trophic level, bacteria and fungi are the second and interact directly with the plants. Bacteria and fungi are the first thing we look at when evaluating how effective a compost will be. 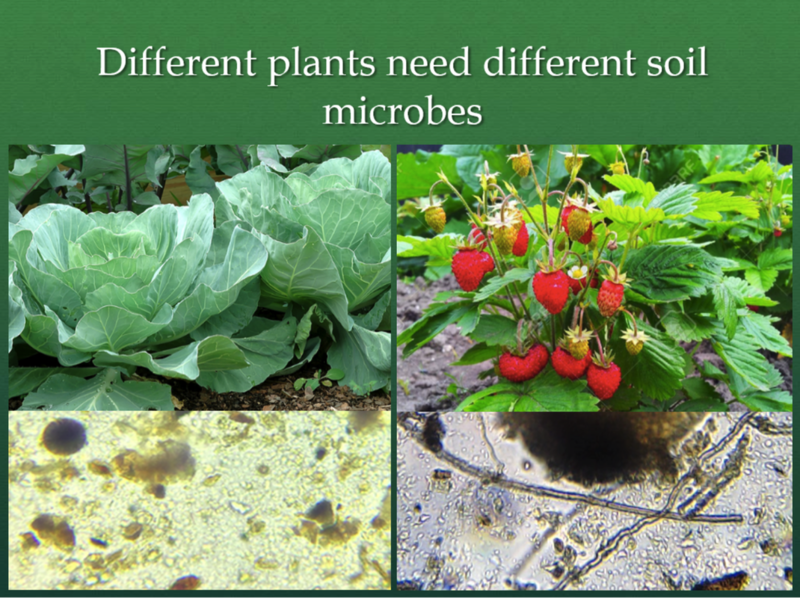 Plants generally need a balance of bacteria and fungi that can change depending on what is being grown. A bacterial dominant soil will promote the growth of weeds and some grasses. On the other hand, a fungal dominant soil will promote the growth of trees and strawberries. Most crops that are grown in home gardens or planted in farm rows fall in the middle of this bacteria-fungi spectrum. This means that the soil must have an equal balance between bacteria and fungi and this is what we target. When we produce our worms castings we feed our worms specific food sources to promote the growth of both bacteria and fungi. We harvest our castings and check for the bacterial-fungal balance microscopically. Below you can see what we look for under the microscope. Bacteria is the smallest living organism and contributes to all aspects of microbial life. It provides one of the main mechanisms for breaking down organic matter and also contributes to nutrient cycling. Bacteria is the base of the microbiological environment and provides a food source for larger predators. When looking under the microscope, bacteria will be the smallest visible objects (around 1 micron). The bacteria we're looking for will generally have a round or rod shape. Fungi is the other main mechanism for the breakdown of organic matter but also serves many other functions in connecting plants with nutrients. 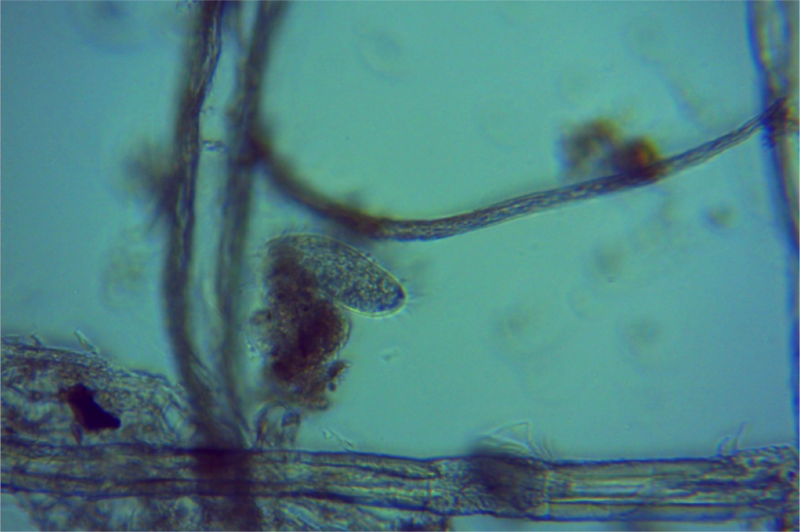 Fungi strands will adhere to root systems and grow outwards. The fungi is able to find and retrieve the nutrients the plant requires and present them in a form the plants can immediately take in. 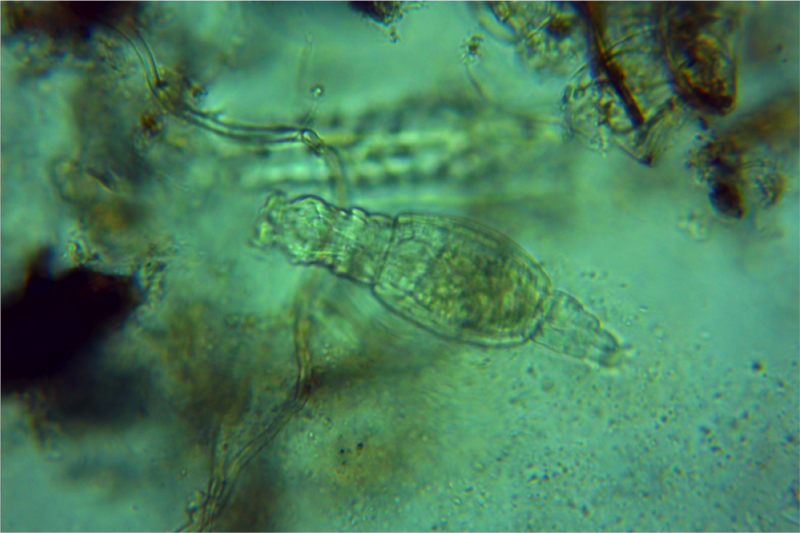 When looking under a microscope, fungi will range from clear to dark brown in color. It will be thin and long with smooth, straight sides. The thickness is usually two to four microns thick and the length can vary. They next level or microbial life is the predators. Predators, such as nematodes, amoebas, and micro-arthropods, feed on and digest bacteria. This creates a nutrient cycling environment that converts the nutrients into a form that plants can easily and readily access. Pictured below are what these predators will look like under the microscope. Nematodes play an important role in nutrient cycling by consuming and digesting bacteria. We try to find at least one in every slide we look at. Amoebas are a type of protozoa that benefit the soil by consuming and digesting bacteria. We're usually looking for testate amoebas. Micro-arthropods are a higher level predator in the microscopic world. They are very large and have a huge impact on their environment. There are certain microbes that thrive in anaerobic environments. These include ciliates and insect larvae. 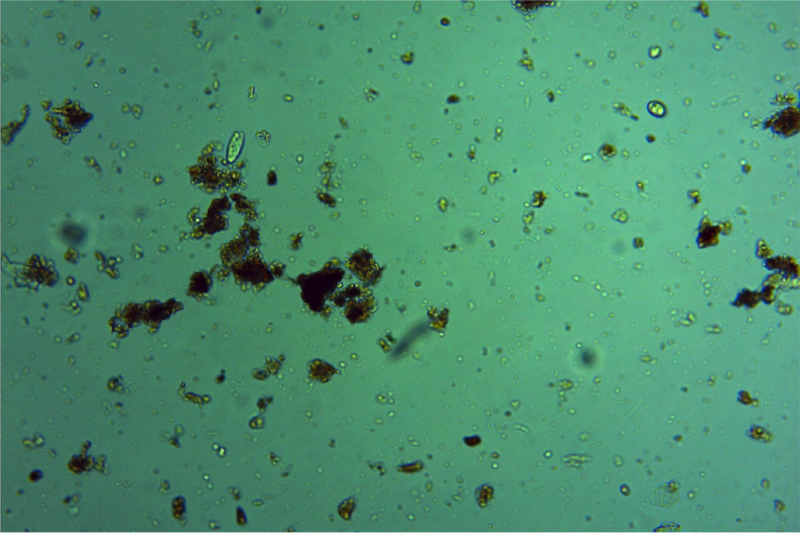 While not directly harmful to you or your plants, seeing either of these organisms under the microscope is a good indication that anaerobic conditions are present in the sample being tested. This is an important finding because many harmful microorganisms live and reproduce in anaerobic environments. Pictured below are microscopic images of the two common anaerobic indicators we look for. Ciliates are another type of protozoa identifiable by their small hairs (cilia) and high speed. They can be seen zooming around the sample faster than any other microscopic life and flourish in anaerobic environments. Insect larvae are another indicator of anaerobic conditions but are not cause for concern unless multiple are located in a single slide. They are easy to locate due to their large size and unique motion. They secure their tails and extend and compress their bodies to reach food.